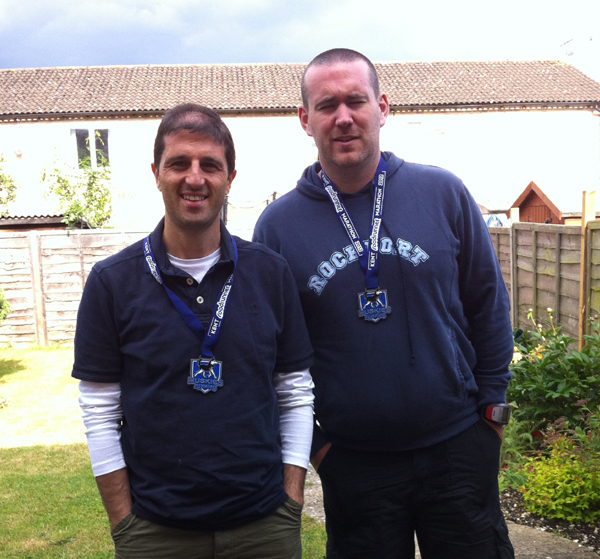 Matt Brown and I took part in the inaugural Kent Roadrunner marathon yesterday organised by Ian J Berry. We travelled down the night before and stayed over at the Holiday Inn before enjoying a swift early morning cooked breakfast before heading to the event. We arrived around 7.45am and registered collecting our race numbers and wrist bands. The event was being held at a recently opened CycloPark and boasted good facilities (plenty of parking, changing rooms, cafe) for the 200 – 250 runners who were taking part. The event itself would be held on the tarmac cycle track which was an undulating 1.7m course. The reasons for the wristbands was that each runner would be required to complete 17 laps and the method of tracking would be to remove a wristband each lap. When you had no bands left you were on your last lap. The race also had chip timing so you would still get an accurate result. The weather was wet early on and settled down to light rain close to the start. I was just recovering from a calf injury and hadn’t run for a week and wasn’t completely sure how the calf would hold up but decided to give the run a go and ease off the pace if I felt some discomfort. Anything between 3.30 to 3.45 would have been ok for me I guess. 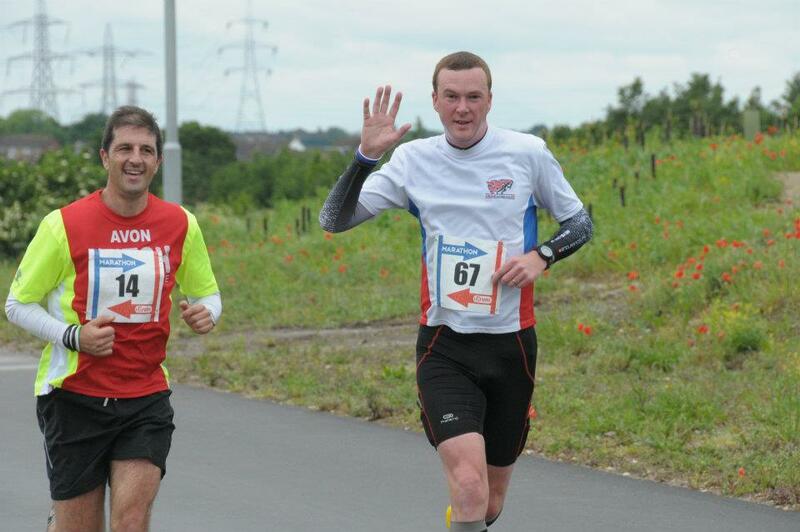 Matt was taking part in this second marathon and had a 4.45 target in mind. We met my lunchtime running buddy Matt Dunn in the car park before the race who was taking part in his first marathon since the Brathay 10 in 10 2 weeks earlier. (You would have thought he would be fed up of marathons by now). I also spoke to a few other Fetchies who I hadn’t met before aswell and a couple of others were also marshalling (Colin & Sue). As we lined up for the race, the rain had eased off leaving cool conditions and we started promptly at 9am. Matt Dunn and I ran together for the first few laps at a pace of around 7.10’s which was a little quick based on our existing PB times of around 3.22 but felt comfortable (it always does when you’re fresh). We got to about 8 miles feeling pretty good when I had to stop off to use the portaloo position just off the course and Matt proceeded on ahead. The next few miles to the half way point were at a similar pace but I started to feel the strain of the fast start and decided to slow the pace back to something around the 7.30m/m mark and see if I could maintain this. I guess not having a running buddy at this point also made it a little tougher. With a lapped course, I was starting to recognise people as you over took them (and a handful overtook me) and there was a bit of banter around the track. I was a little uncertain of the lapped course at first but it wasn’t that long and mentally it was good to tick these off and nice to have some certainty over where you were on the course, where the aid station was. I passed Matt Brown a couple of times who was pretty much on target for his plan by following a disciplined and steady pace. The tale for the final third of the race was me slowing down and in all honest struggling a little bit. My previously injured calf was sore and I have a slight concern it would “ping” at some point but my quads were also really sore from the undulating nature of the course (As of writing this report the day after my left and right hips have a sore point on them). I felt I had the energy to run but the tightness and soreness in my legs were somewhat hampering the effort. I decided to have a little “rest” point after each lap where I would slow, grab an energy drink, walk for a few yards to drink it and then plod on. My lap times generally slowed to the 8 – 8.30 m/m region as I ticked off a few more laps. They say the half-way point of a marathon is the 20 mile mark and I felt that at this event. Despite Corona’s encouragement on the PA system as I passed each lap with a “looking strong” comment, I didn’t really feel it and was slowing each lap. 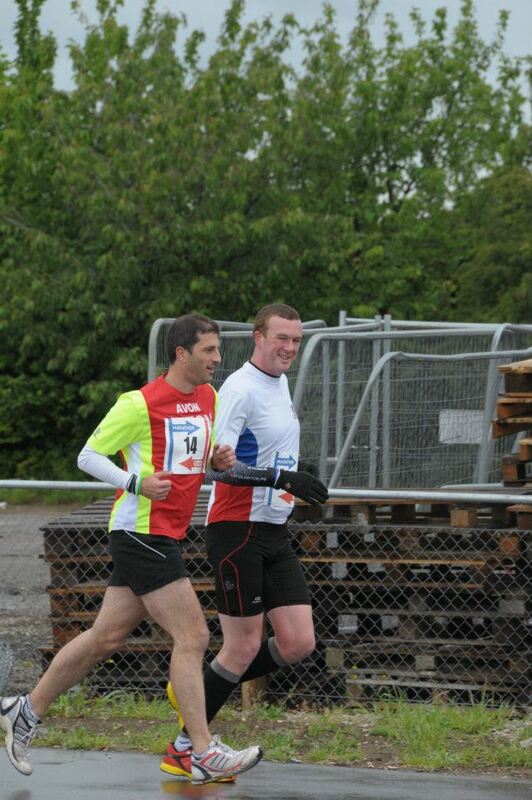 For the final few miles my lap times were creeping towards the 8.30 – 9m/m region as I plodded to the finish. I even started to walk the small hill before the end of each lap and was slightly embarassed when Matt Dunn spotted me from another part of the course and shouted something to me at this point. It was quite a nice feeling to give up the wrist band for the final lap knowing this would be the last time round and I plodded around the course. I had been calculating my finish time in my head for a little while and knew despite the slight struggle today I was still pretty close to a personal best although this was slipping away each lap as I got slower. Just before the end of the course, I walked up the last hill then glanced at my watch and saw a PB time was still possible just by a second or two. So I gritted my teeth and tried to pick up the pace as fast as my legs could manage. Unfortunately, there was no trademark sprint finish for 20 yards but more a steady paced finish from 200 yards in a finishing time of 3.22.33. I’d missed by PB by about 10 seconds! I was initially a little disappointed but then thought about my pre-race goals and decided it was a pretty good result off the back off a minor injury and considering I struggled for the last third of the race. Matt Dunn finished in a cracking time of 3.13 (a 10 min PB) so he managed to keep his pace going over the distance (that’s his 50+ marathon experience vs my 5 marathon experience) and met me at the end where he kindly grabbed my a few drinks as I needed to sit down and stretch my legs. After a 10-15 minute sit down, I headed back out onto the course to help pace Matt Brown around for this final few laps. I took a few short cuts to stay ahead of him and encourage a few other runners as I tried to stretch my legs a bit. Matt finished the marathon in 4.48, a couple of minutes over his target but a new PB by 30 minutes so a great result for him. Overall between the 3 of us, it had been a pretty good day. Well done to Ian & team on a well organised event. I must comment on the medal which was unique in its design and quality, it truly is a heavyweight medal which I can attest to as it was bouncing away in my back pocket as I was pacing Matt around at the end. Following the race, we took advantage of the changing/shower facilities to get cleaned up and then used the cafe facilities to have a burger and chips before heading home. Final thoughts for me is that whilst I don’t consider myself a real marathon runner, my marathon time is certainly capable of some improvement (perhaps by 5-10 mins) but I do need to do a lot more sustained “pace” running which I don’t do at all to be honest (just lots of short runs at lunchtime/home and a long plod at the weekend). The enforced rest from the injury probably worked in my favour at first as I did feel fresh at the start of the race but it did hamper me a little towards the end. A little more even pacing wouldn’t go amiss either.